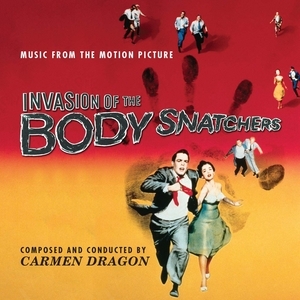 The 389th Soundtrack of the Week is Carmen Dragon's score for a great movie, a real classic: Invasion of the Body Snatchers. The music is very forward looking, particularly in its aggressive use of staccato piano passages to indicate danger. It's hard not to think of Jerry Goldsmith when listening to it. Pretty much every cue is inspiring in how effectively and economonically it creates mood and atmosphere. While it's mostly tense and suspenseful writing, the love theme and other more relaxed pieces are also incredibly well done. Dragon's ability to take some simple figures and use them to build excitement simply by a canny use of dynamics and instrumentation is formidable, perhaps best expressed in the "They're Over Here" music. Really a great score to a great movie. The music heard on its own is something like a revelation.